First of all, we need to set a hostname for our machine. We want to access our machine using an easy to remember name instead of its IP address. 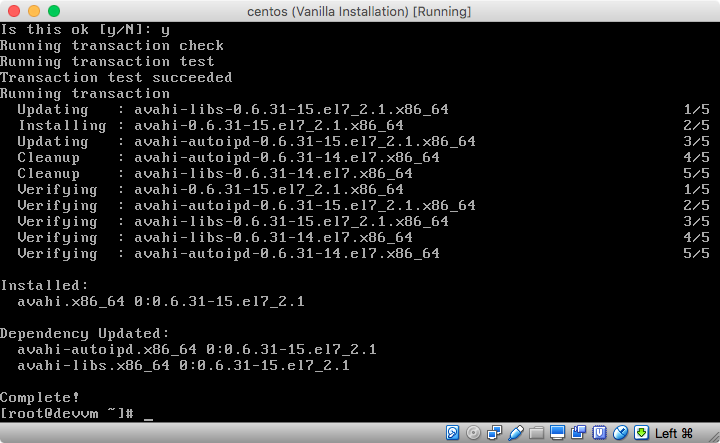 It’s so much easier to ping centosvm instead of ping 192.168.1.42 isn’t it? Plus, the IP address might change, but we won’t care since all we need to know is the hostname to access the machine. 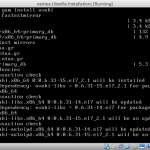 Setting a hostname will not actually do anything by itself. Other computers will not be aware of this name, just because we set one. 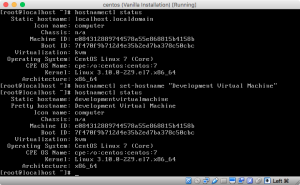 However, CentOS (or any other operating system) might use this name internally or to conveniently “advertise” itself to the network, or we can manually set up services that will do this on our behalf. Now, according to the RHEL Documentation on host names (make sure you read the whole chapter, it’s very short), there are three different hostnames a system can have, and there are three different ways to set them. 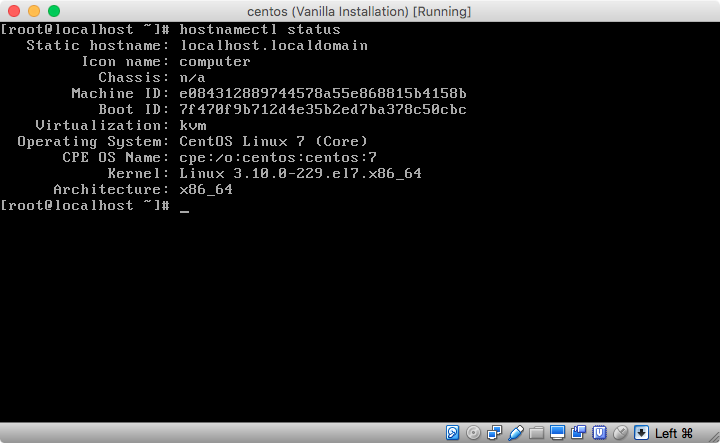 And finally, transient… now, the documentation says the transient hostname is maintained by the kernel. Why? I don’t know, nor could I find any more information by googling it. 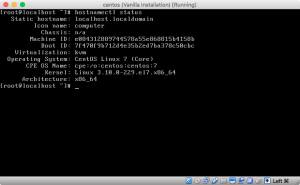 Why won’t the kernel use the static hostname? Don’t look at me. Anyway. 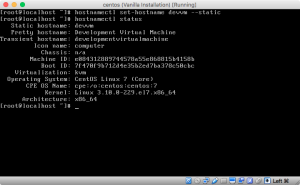 We can set a hostname using either hostnamectl, nmtui, or nmcli. On both the documentation pages of nmtui and nmcli it mentions that “at time of writing, changing the host name in this way will not be noticed by hostnamectl“. This leads me to believe that hostnamectl is the most appropriate tool to handle this job, although it’s doable with the others as well. So, according to the documentation, we need to issue hostnamectl status or just hostnamectl (the status is implied) in order to see our current hostname. Only the “Static hostname” (first line) is of interest right now. The hostname localhost.localdomain is default to most Linux distributions, or at least the ones I’ve come across. Now, let’s change this bad boy. 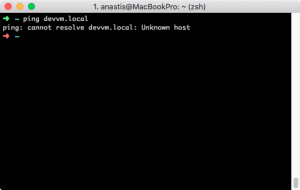 hostnamectl set-hostname "Development Virtual Machine"
We can now see the static hostname changed to devvm, as well as a new line added with the Transient hostname set to developmentvirtualmachine. Why? I don’t know. Moving on. 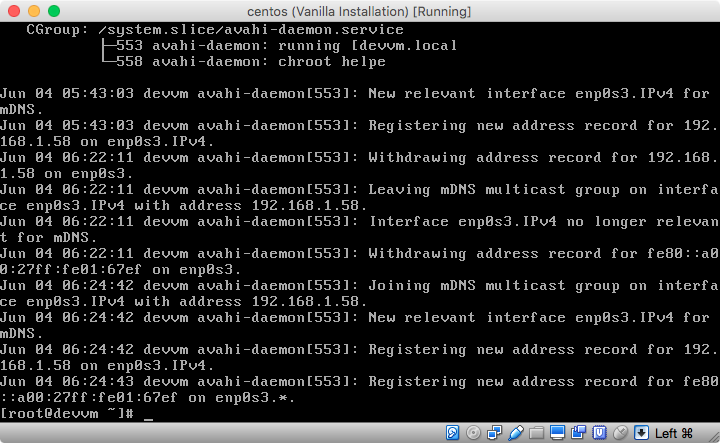 Can’t ping devvm. Do you want to poke one of your friends instead? Computers don’t magically know each other’s names. They need to somehow translate those names to IP addresses. There are various ways to achieve this, each one having its most appropriate use-case. Just read a few of the answers other users got when asking the same question. Specifically, read this answer as it’s better written than I ever could have written in. In short, we are interested in Multicast DNS (mDNS for short). It does not require a server such as DNS, it does not require us modifying any files every time an IP address changes (and in the case of our VM, most probably on every restart), and it works with Linux, Mac and Windows. In short, it requires zero configuration! The perfect thing! Yum will determine the fasts mirror, will fetch information on the package we requested, check its dependencies, and ask us whether we want to install avahi and update its dependencies. Just type a y and press enter to confirm. It will then ask us to import a GPG key, just say yes to that to. 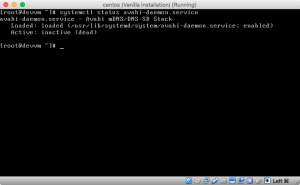 After a few seconds, avahi should be installed on your system. 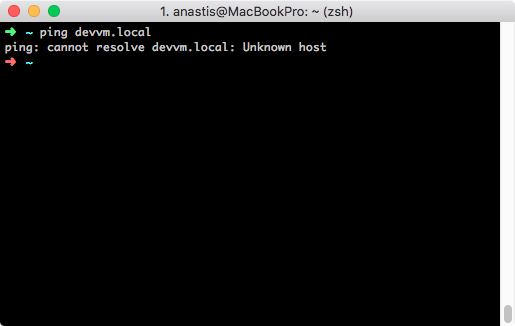 Now, avahi makes our hostname discoverable by appending .local at the end, so I should be able to ping devvm.local successfully. 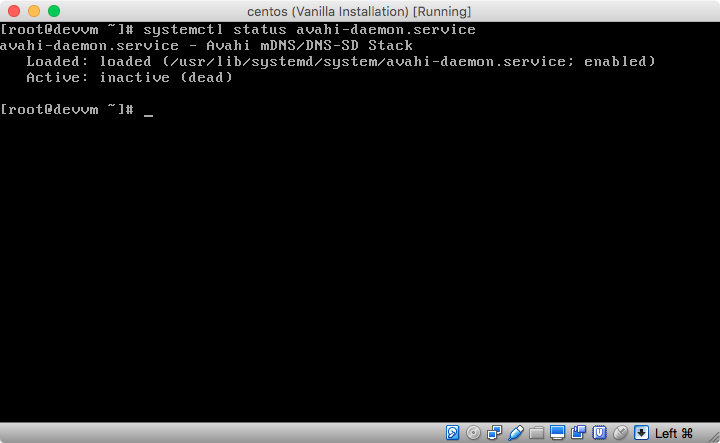 This is not the case however, since the avahi daemon does not run yet. 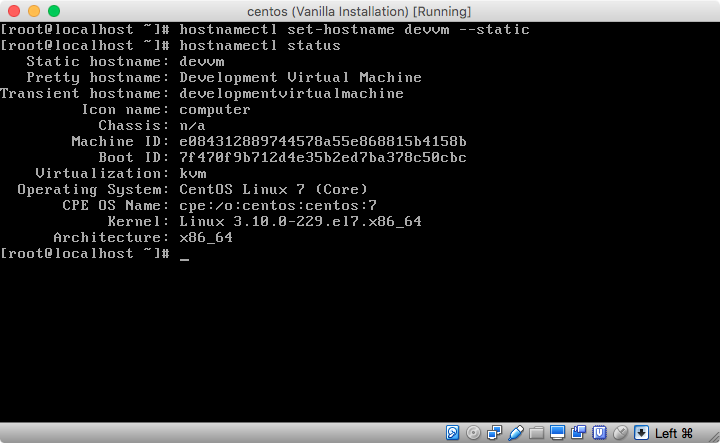 Let’s reboot the VM, just in case the service is set to run on each boot. Just a sidenote here that we can avoid rebooting every now and then, by restarting the various services (or daemons). However, I don’t want to mess around with systemd just now, and want to be sure whenever I start the VM everything works as expected. So, just reboots for a little while longer. They are very fast anyway. In order to determine if avahi is going to be starting each time the machine starts, we can type systemctl status avahi-daemon.service and we’ll get some information on the specific service. 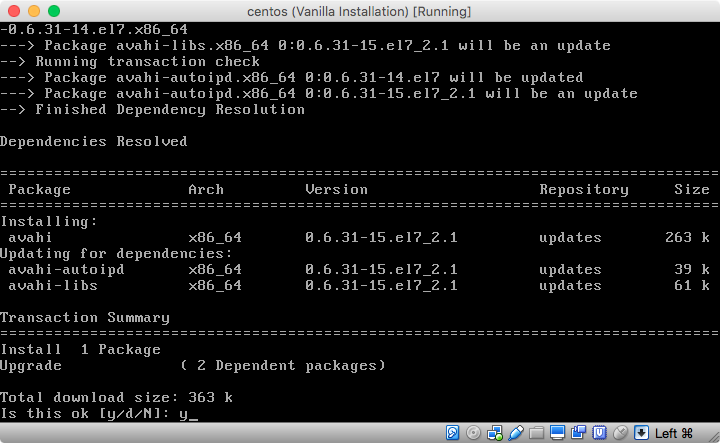 On the end of the Loaded: line we see the word enabled which means avahi is set to run on startup. If it was already running, we would see quite a lot more information. Let’s reboot to confirm that it actually runs after a restart. 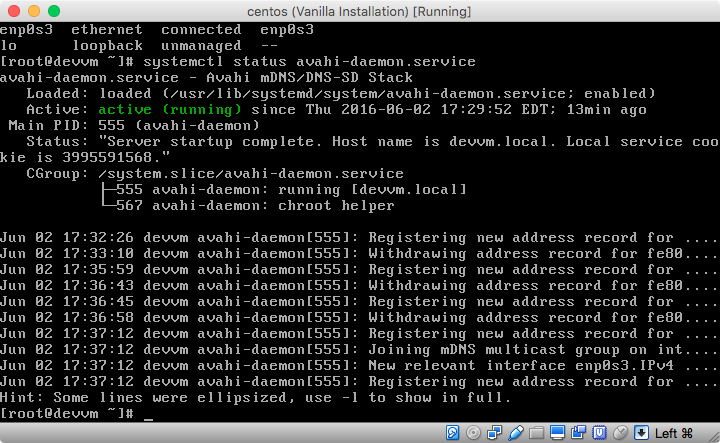 Once the machine reboots, I run nmcli d to make sure it’s connected, and then systemctl status avahi-daemon.service to see if avahi is running. Everything looks perfect! Let’s (virtually) disconnect the network cable and then reconnect it to see what happens. On your running virtual machine window, you’ll find a series of icons on the lower left border. Find the one that looks like two computer monitors. 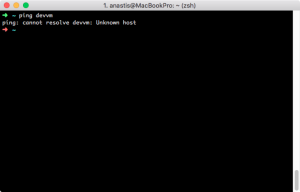 If you hover over it, it will read something similar to “Indicates the activity of the network interfaces:“. Click on it and then select “Connect Network Adapter” so as to uncheck it. 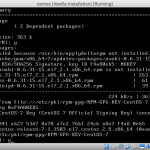 Run nmcli d continuously until the state reads unavailable (so we know linux got notified of the disconnect) and then go back and re-select “Connect Network Adapter” so it’s checked. Again, run nmcli d to make sure we’re reconnected. Run systemctl status avahi-daemon.service -l (that’s a lower-case L, it shows the full messages instead of truncating them) and we’ll see something similar to the screenshot below. 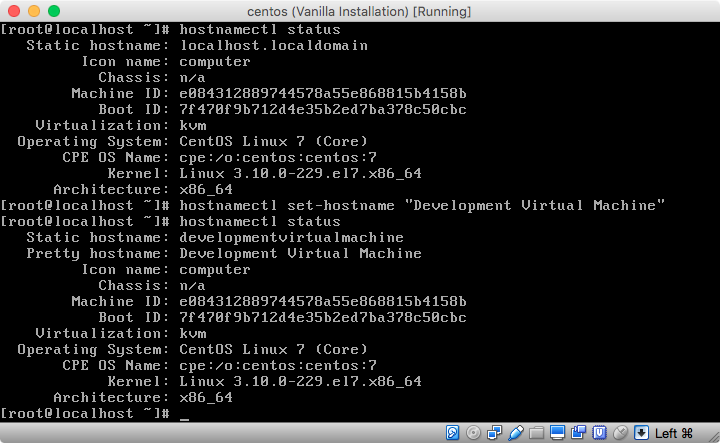 Let’s try and ping our VM again. Nope. No luck. Let’s restart only the avahi daemon. 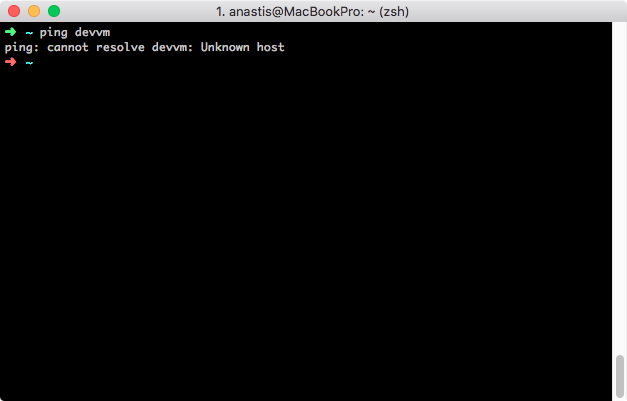 Type systemctl restart avahi-daemon.service and press enter. There’s no feedback, therefore no errors. That’s good! 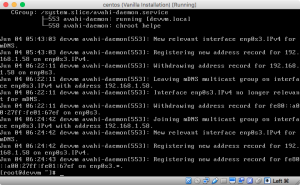 Let’s try pinging the VM again. Oh wow! It works! So, we’re now in a good path, i.e. 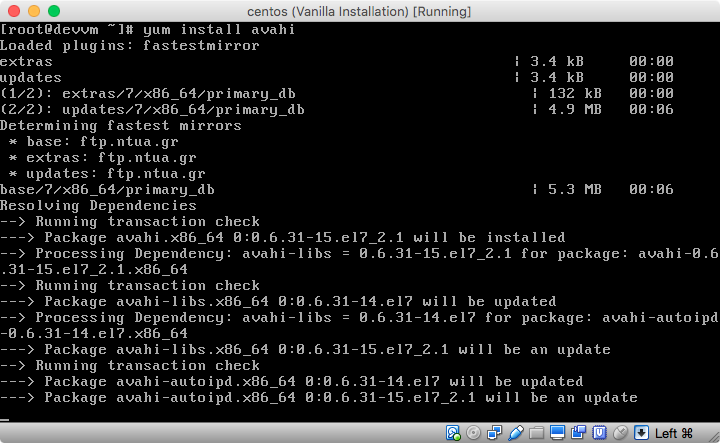 we know avahi works alas, not exactly as it should after boot. Rebooting my virtual machine confirms it again doesn’t work, and the whole process before can bring it to a working state. Furthermore, I noticed that after 5 minutes or so, avahi would stop working again, i.e. I couldn’t ping the machine using its hostname. 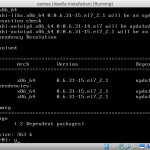 I was about to dump CentOS for Debian, when searching for the term centos 7 avahi stops working I stumbled on this thread which mentions the firewall. It actually makes sense. 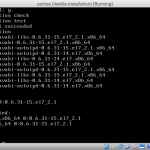 If the firewall is configured to block incoming connections to avahi, this explains why it won’t work in general. 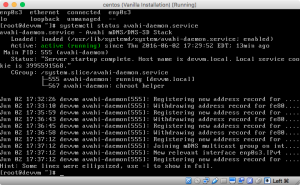 When restarting the avahi daemon, it probably initiates some connections so the firewall temporarily whitelists it, and then it appears as working. After a specific time frame, it’s again blacklisted. Perhaps, when the machine boots, avahi starts before the firewall, so the firewall never has the chance to listen to the internally-initiated connection by avahi, therefore it never temporarily whitelists it. It’s a plausible explanation for my issues. Let’s reboot the machine and ping. It works! Let’s wait 5-10 minutes as well and ping again. It works again! I thought this nightmare would never end! Woohoooooooooo! Thank you for your post. The firewall was what I was missing also! Very nice article, especially the detail you brought to it, the many links and also what you searched for on Google.